The question I posed prior to the fight was if Pacquiao would wake up feeling like a young, hungry lion or a tired, old house cat. The 13,025 people in attendance for the fight definitely saw Simba, not Garfield. Pacquiao kept on stalking and assaulting Broner even during the championship rounds when it should’ve been the other way around. 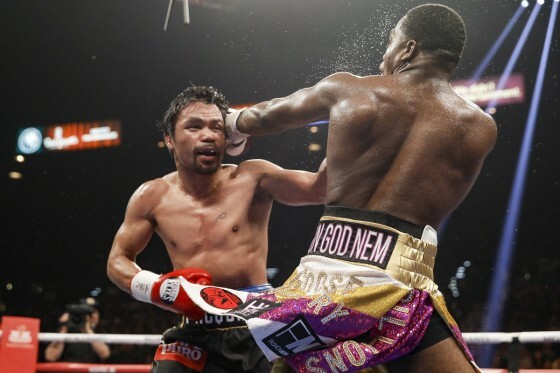 Broner cried robbery after the fight, saying he felt like he controlled the pace and landed the cleaner punches, while Pacquiao actually wanted to go for the knockout, but was advised by his trainer Buboy Fernandez to be more careful and slow down a bit in the final rounds, advising that he was ahead on the scorecards. With the win, questions regarding a rematch with Floyd Mayweather Jr. naturally resurfaced. Mayweather was in attendance at the fight as well as his promotional outfit Mayweather Promotions, involved in making the event. But according to Mayweather Promotions CEO Leonard Ellerbe, the unbeaten and retired legend has absolutely “no interest” in coming out of retirement to face Pacquiao. “He has nothing else to prove. I’m very happy for him. He’s retired,” Ellerbe said.